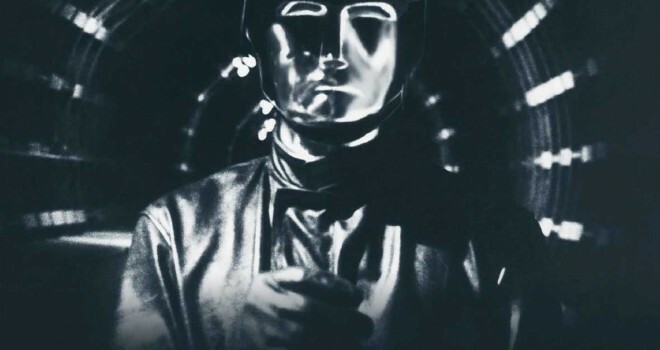 Chemical brainwashing, android police, CCTV and ultimate totalitarian control are features of George Lucas’s stylistic, feature length 1971 debut. Though not regarded as a potential classic upon its release, THX 1138 has gained acclaim over the years and the role call of the film’s credits lays testament to this: Produced by Francis Ford Coppola, starring Robert Duval and Donald Pleasence, written by Walter Murch, alongside Lucas himself and the original score composed by Lalo Schiffrin. That cult status is also born out by the widespread use of audio samples from the dialogue and soundtrack by a host of influential electronic artists including, Nine Inch Nails, The Shamen, Meat Beat Manifesto, UNKLE, Orbital, Front 242, Laibach and Clock DVA. Murch is widely recognised as one of the most influential sound designers and his work on THX 1138 was years ahead of its time. Though stylistically similar to Yul Brynner’s gun-slinging in the classic sci-fi western ‘Westworld’, THX 1138 is a darker affair, a dystopian nightmare of Huxley’s ‘Brave New World’ meets Orwell’s ‘1984’, and one in which the visual aesthetic stands the test of time better than Kubrick’s ‘A Clockwork Orange’. Where the “symbiotic” development of society and technology has become unbalanced in a way that profoundly questions our current use of information technology. Commissioned by Music Beyond Mainstream. No Nation brings Asian Dub Foundation’s, live score of George Lucas’s THX 1138. Now, their strongest line up yet combines their trademark fusion of punk rock, electronic beats, reggae, bhangra and hip-hop that has attracted many famous fans, from Primal Scream to Radiohead, Sinead O’Connor to Chuck D, all former touring partners and studio collaborators. Over the years, this ever-evolving band have continued to expand their agenda, delivering live soundtracks to film and tackling operas, while taking their fiery mix of music and social activism to far-flung places where conventional western rock bands rarely tour: Morocco, India, Cuba and the favelas of Brazil.